After I made Nutella, even if I was eating it out of the jar non-stop, I realized that the kids did not share my enthusiasm in consuming it. I had to make something with it, then! 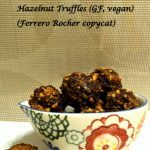 There are many versions of Nutella truffles and pies out there. 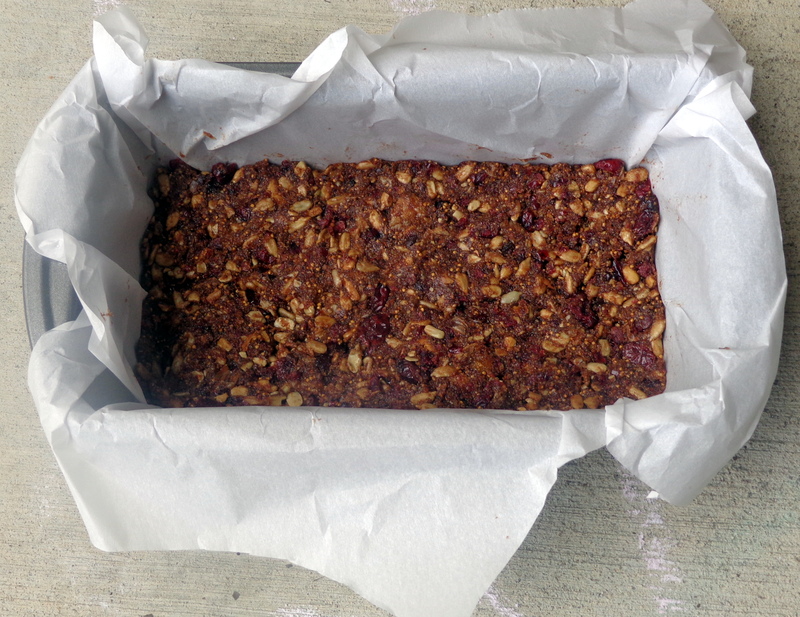 After much thought, I settled on trying something very simple, a no-bake bar for a quick snack. This is disappearing fast in my house and I will make another batch to take to Fiesta Friday #21, hosted by Angie @ The Novice Gardener. 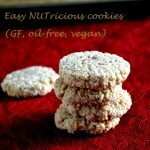 Sharing this also at the Virtual Vegan Linky Potluck 8, hosted by Annie of An Unrefined Vegan. 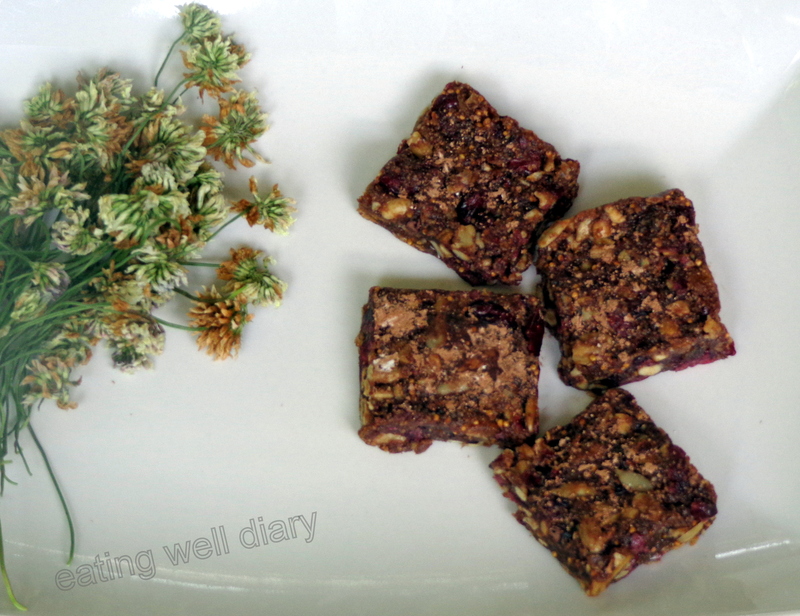 I have used a combination of dried fig for sweet and cranberries for tart flavor. Sunflower seeds for crunch. 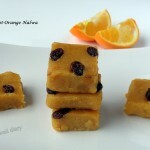 Any dried fruit can be used, with other nuts as well, to make this versatile snack. 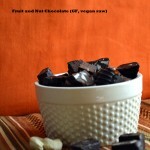 cacao nibs/dark chocolate bits- 2 tbsp. * Add roughly chopped bits of fig, cranberries in a food processor/blender, pulse. * Add Nutella, sunflower seeds, chocolate bits and pulse again till combined. * Transfer the chewy mixture to a loaf pan lined with parchment/wax paper. Refrigerate for 1 hour. * Cut squares and coat with cocoa powder/powdered sugar mixture (optional). yes, they do. I’m happy! thanks, Elaine. Yes, they are just like your goodness bars! Wow! Those energy bites look awesome, Apsara. thank you, Kloe. Happy FF to you too! Apsara, I think you nailed these energy bites. I can almost taste those tart cranberries and that homemade nutella. Fabulous! happy Fiesta Friday to you too. Have a great weekend! Oh definitely a weakness of mine… nutella and chocolate. What a sweet temptation! Beautiful! These look so good! I wish I had a piece right now! Happy Fiesta Friday! This sounds delicious and easy to make. I love the no-bake idea! thanks, Liz. I like it too! How could I go past this? it looks great and so healthy. Thank you for sharing the recipe (and the food to go with it!). Hi Apsara! I am back! 😉 Really excited to give this Quintet of Radiance Award to you! 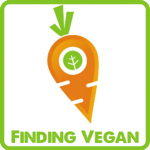 Hi Apsara, You have a wonderful blog. Do check out mine at http://Parsicuisine.com – feel free to leave comments. thank you. I visited your blog and find it very inspiring! The cookbooks look great too. Love no bake bars. Delish and healthy. Apsara, please add “notify me about the new posts via email” button on your post in comment box. I am loosing on your posts. This way, I can get your posts in my inbox. thanks, Sonal. I have the widget ‘follow via email’ in the left top corner. I understand, even I lose out on posts even if I check my reader many times a day! 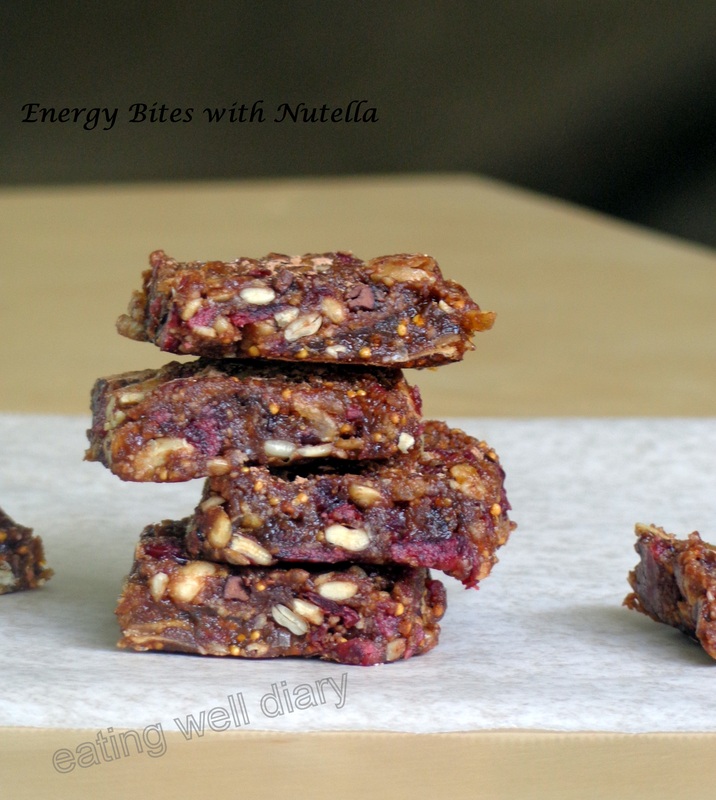 Love no bake energy bars and have been wanting to make them for sometime now! Gotta try these! please do, they are super easy too!